According to the website for the Texas Commission on Environmental Quality, data has not been made publicly available since 5 a.m.
Channel 2 Investigates reached out to Deer Park for a copy of the data. Officials responded around 4 p.m. Monday with figures from a private firm, Center for Toxicology & Environmental Health LLC (CTEH) from Kemah, that outlined results from air testing between from 5 p.m. Sunday to 7:42 a.m. Monday. KPRC requested raw data numbers for C2I, however, those numbers were not included in the report. Officials in the nearby town of La Porte indicated to Channel 2 Investigates that it has not received a copy of any electronic data. They’ve only been given verbal confirmation from the Harris County Pollution Center that they are in the all-clear. At a 1 p.m. news conference, Channel 2 Investigates reporter Joel Eisenbaum questioned Bob Allen, of Harris County Pollution Control, about the lack of data at the Deer Park site. Allen indicated that the sensor may be down for maintenance. Eisenbaum also pointed out that the sensor at the Clinton site has also been down since 9 a.m.
Eisenbaum asked Harris County Judge Lina Hidalgo to release the air quality data that ITC compiled. Hidalgo replied that ITC has released it. 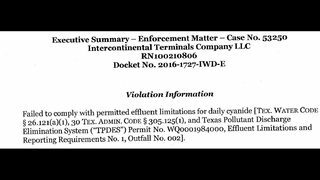 There are three cases which involved a total of $38,300 in TCEQ levied fines since 2009. Two of the cases involved air quality violations, one of the cases involved a water quality violation, with cyanide. To view an interactive map of TCEQ reporting sites, go to TCEQ.Texas.gov.